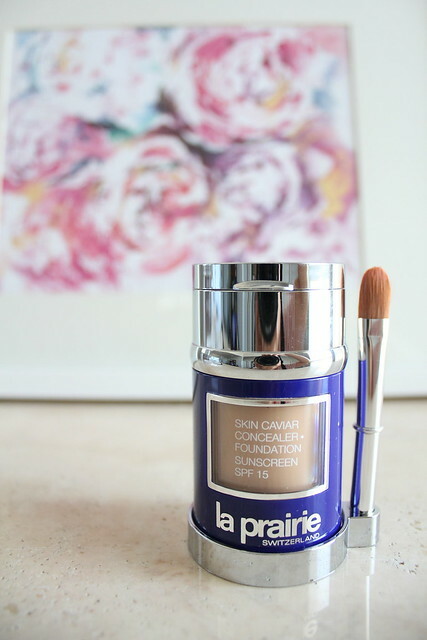 Over the last six months or so, I’ve been using the La Prairie Skin Caviar Concealer + Foundation (C$285). This is by far the most expensive foundation I’ve ever used, and I believe it is also marketed as being the most expensive foundation on the market. Despite it being a makeup product, it contains heavy doses of La Prairie’s signature Cellular Complex, as well as the famous Caviar Extracts, so it doubles as a skincare product. As foundation covers your entire face for often longer than 12 hours a day, you want to make sure that you’re giving your skin only the best products. Why waste hundreds of dollars and hours of time each week on your skincare routine if you’re going to smother your skin in crappy foundation all day? 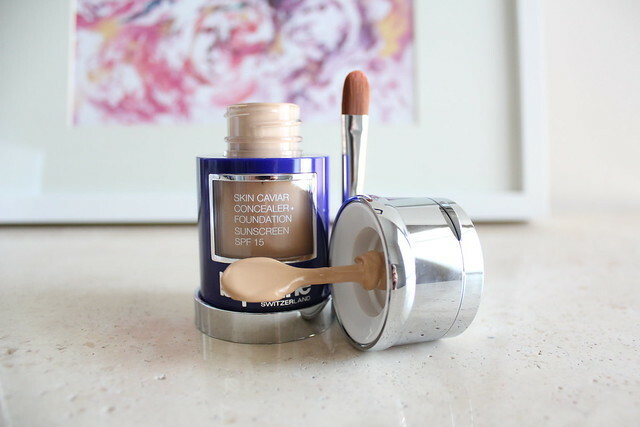 The Skin Caviar Concealer + Foundation contains a top and bottom part. The top cover flips up to reveal a high coverage brightening concealer and high definition mirror underneath the cover, and the bottom is a medium to full coverage foundation that is super lightweight but still offers that nice coverage. You get 30mL of foundation, which is normal, but I’m not sure how much concealer you get. It also comes with a nice mirrored stand, which has a slot to rest the mini concealer brush that comes with the set. Presentation-wise, it is definitely very beautiful, intricate, and luxurious. Even in little details like the mirror, which is clear and high quality with no distortions, you get a sense of luxury. 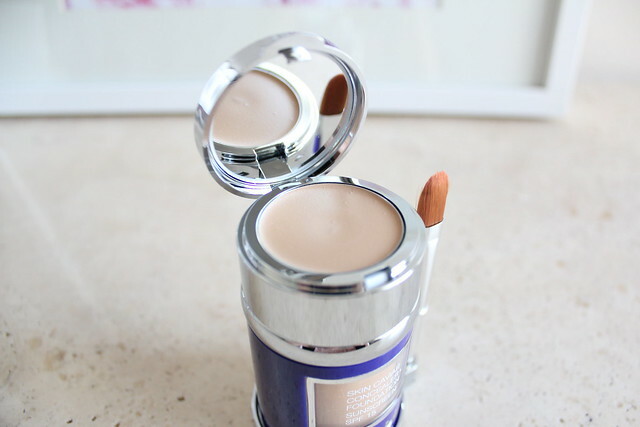 The foundation itself is in a thick, plastic pot with a transparent side so that you can see how much you’ve used. It comes with a spatula, which rests in the foundation pot, and you can apply by directly dapping foundation onto your face with the spatula. This is my preferred method because it doesn’t waste product (this stuff is $9.50 per mL, which means each time you wear it, you are likely using about $10 worth of product! ), but the major downside is that it doesn’t protect the product and the skincare ingredients from oxidizing, and also bacteria can easily get into your foundation since you are directly touching the main pot of foundation each time you use this. That being said though, I only use this product after I wash my face, so hopefully that will prevent bacteria. In terms of texture, it is a thicker cream, but still ultra lightweight. I apply with my fingers, again because I want to waste less product, but I also find that the warmth from my fingers helps to blend it in my skin more naturally. It does blend out absolutely flawlessly, and you can also layer it without caking, creasing, or drying your skin out. It does not cling to dry spots at all, rather it is lightly hydrating, and keeps my skin feeling lush and glowy. I don’t always need to powder, especially if I am wearing it in the winter, and it lasts me all day, with minimal fading, until I want to remove it at all. It is one of my go-to foundations for when I want to look my best. I can wear this with light, barely-there coverage, as a tinted moisturizer (by mixing with my La Prairie moisturizer), or as a medium-to-full coverage foundation, depending on my mood. It wears beautifully in all three situations. As for cons, I’ve mentioned earlier that the pot design isn’t the greatest. I would prefer to see a pump if possible, since there are so many skincare ingredients in the foundation that we’d want to protect. 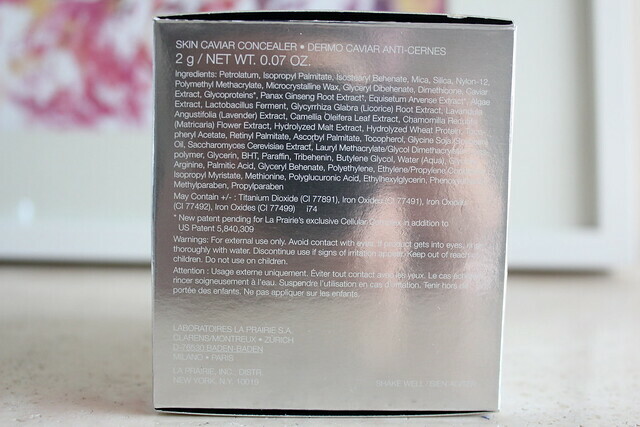 The other con is the concealer – it does not have very good coverage, I feel like I can layer up my foundation underneath my eye area if I wanted similar coverage. It also creases on me, which is a little unfortunate, but most concealers crease so I wasn’t too surprised. Despite the convenient packaging for both foundation and concealer in one, I would actually prefer to see the price reduced and the product coming with only foundation and no concealer. 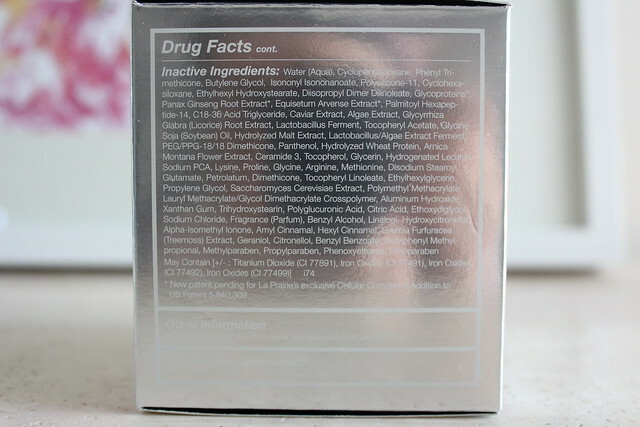 Another foundation-like product that is in La Prairie’s collection is the Cellular Swiss Ice Crystal Transforming Cream. Between the two, I am strongly for the Skin Caviar Concealer + Foundation, because despite it not having that high SPF protection that comes with the Transforming Cream, the finish and wear times are significantly more favourable in the Skin Caviar Concealer + Foundation. The price differential is not big, the Transforming Cream is only $35 less than the Concealer + Foundation. While a $285 foundation is not everyone’s cup of tea, I do firmly believe in taking good care of your skin, over buying nice clothes or going out to the movies. When you’re 70 and with flawless skin, you will continue to be radiant and feel good about yourself. The shade I wear is Warm Linen and it’s the perfect match for my light medium skin tone with neutral undertone. For reference, I am also a Guerlain 02, Dior 020, Chanel B20. 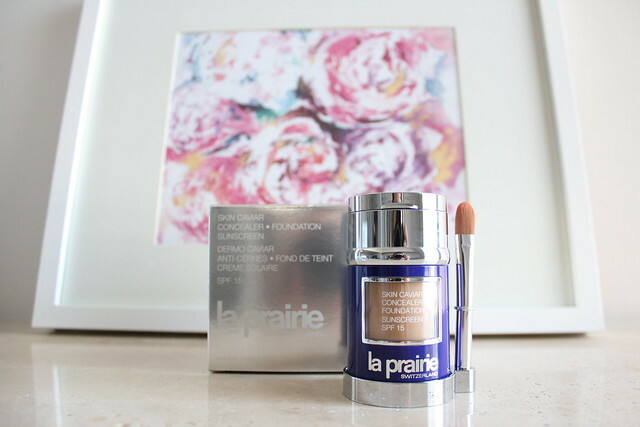 You can purchase La Prairie Skin Caviar Concealer + Foundation at Holt Renfrew. If you’re not sure what shade you are, please make your way to a La Prairie counter to get matched. 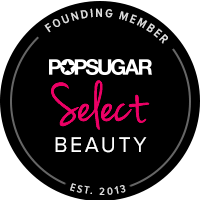 They can also provide you with generous samples to try out your chosen shades at home and out and about in your natural environment before making the commitment to buy. La Prairie is expensive, a luxury brand, but it is foremost an experience. I hope you’ll fall in love with the La Prairie family of products like I have. This post contains PR samples; all opinions are my own. « Kiss Lashes, the best lashes money can buy! It’s cool to hear that it’s so lightweight feeling, especially since the first ingredient is petrolatum! It does sound lovely; do you prefer it over your Guerlain foundations? I still love Guerlain Parure Gold, and I think in terms of value, Guerlain Parure Gold is superior (it’s still expensive so not really real value lol).